With a background in goldsmithing, Dellana met the late Jim Schmidt, and art knife making history was born. 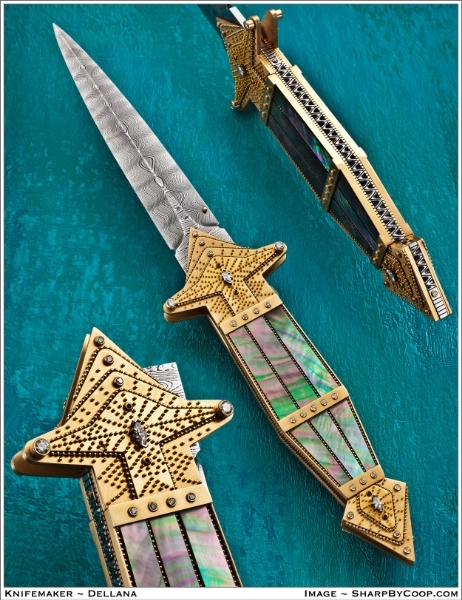 Incorporating her passion for gold and jewels into the art of forging and bladesmithing, Dellana became a full time knifemaker in 1996 and represents the epitome of the art knife making world. Her totally sole authorship creations have been seen and collected all over the world and have won numerous awards. She is a voting member of the Knifemakers Guild, a member of the American Bladesmith Society, and one of the twenty five members of the very prestigious Art Knife Invitational held every two years in San Diego.